Bitty City Players cultivates young minds through fun, innovative, active learning. From theater games to scientific exploration to sensory play, our dynamic classes stimulate the imagination, promote teamwork, and develop problem-solving skills. Bitty City's experienced teaching artists are committed to setting the stage for a lifetime of creative thinking, curiosity, and excitement for learning. ​﻿Bitty City Players is an official vendor for the NYC Dept. of Education, working with public schools and Universal Pre-K programs. Click below to learn more and to book your class's workshop! 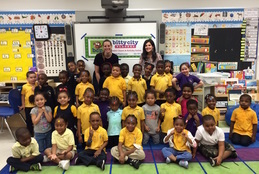 Bitty City Players partners with outstanding early childhood and elementary school programs and camps in New York City. Click below to learn more and to bring Bitty City Players to your school or camp! We offer several classes open to the public for registration. Spots are limited. Click below to learn more!